The Ministry of Justice issued a directive to suspend immediately the activity of the national Administrative Center and all 395 legal entities, or Local Religious Organizations (LROs), of Jehovah’s Witnesses. The directive effectively bans the religious activity of Jehovah’s Witnesses until the Supreme Court makes the final determination. The Ministry of Justice filed a claim with the Supreme Court, demanding that the Administrative Center and all LROs be liquidated and deleted from the official State registry and that all property owned by the Administrative Center and all LROs, which includes all Kingdom Halls (houses of worship), be confiscated by the State. In 2008, the Rostov Regional Prosecutor’s Office commissioned an expert study of the Witnesses’ religious literature. The study concluded that Jehovah’s Witnesses do not urge hostile action either in their literature or in carrying out their activities. 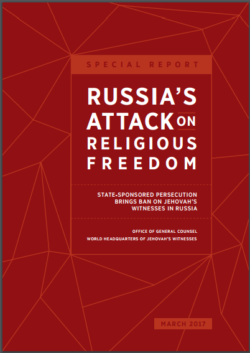 However, the Rostov Regional Court focused on the experts’ opinion that theological discussion in the Witnesses’ literature had “the potential to undermine respect” for other religions. List of Extremist Materials . The court also declared the Taganrog LRO “extremist” and ordered federal authorities to liquidate it, ban its activity, place its name on a list of extremist organizations, confiscate its religious literature and its property. By the start of 2016, similar court actions had declared 88 religious publications “extremist,” liquidated three LROs, and confiscated at least one house of worship. Comments are off. Posted by admin	on Monday, April 10, 2017 at 7:55 pm.